I have a 98 Honda Accord & none of my dashes gauges are working. I noticed it about 4 days ago as I was driving but when I got into my car to go home later that evening they were once again working but then the next day they were back to not working nor have they worked since or now :( I am not sure of the problem. My car does not have a place for a gauge fuse in either of the 2 fuse boxes on either side of the dashes panel. I have a book on my car but it doesn't have much about the dashes gauges in it nor does it state what it could be if it stops working. I can't afford to take it to the Honda dealer at this time cause that can be pretty expensive. Please Help! It sounds like the cluster is going out or you have a bad fuse connection here is a guide to help you test for power at the fuses #6, 9 and 13 with the wiring diagrams so you can see how it works with eh fuse locations as well below. fuse/relay box, and fuse No. 13 (7.5-amp), located in passenger under dash fuse/relay box. If problem exists, replace fuse(s). Thanks for this post I had to get a used cluster for $80.00 to fix it. Start by checking the fuses in the fuse boxes, under hood and interior. 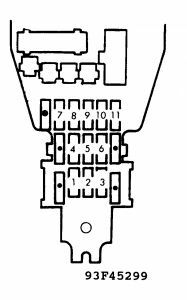 The fuse location may say, instrument panel, gauges, cluster or dash. Hi just replaced the tcu in my 92 accord and shifts ok now but the rpm gauge won't work and the temp. Gauge reads hot instantly, coolant level is fine. Any ideas why? Seems you have a bad ground or problem with the meter cluster. 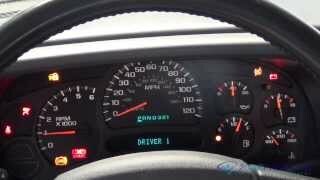 My windows and dash gauges stopped working can anybody help me? For the power windows, check those fuses in the box, also check that relay, in under-hood fuse box. Not only check the fuses, check for voltage on the fuse circuit, use a test-lite or something. My drawing is not very good. On the hinge side of driver door, should be a wiring harness. May have protective rubber boor covering, pull boot back far enough to check proper wire colors, green wire with white tracer is voltage for power windows. Black wire is ground. Check them both. You open and shut the driver door so much, sometimes those wires break. There could be other issues. Check fuses and fusible links? Was the alternator charging before and after the battery installation? After trying a few times I gave up trying to understand what you were trying to explain. 1. Is it the gauges that were not working or the dash lights? 2. You applied power to the meter cluster lights or gauges? 3. Are the taillights working? 2. I applied power to one of the clusters going into the gauges. It was the cluster that is at the bottom left of my gauges. Obviously that cluster affects whats now shorted im guessing. 3. My tailights and brake lights work. Sorry for being unclear again, and thanks for responding. Still cant figure it out. Check # 1 (10A) fuse underdash. O my goodness that worked! The fuse didnt even looked blown, that must have been my problem, I looked at them all like 3 times and they all looked fine but it is working now, thank you so much, you are awesome. Saved me alot of money and time! 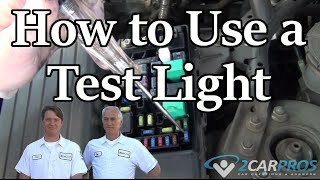 The best way to test fuses are with a test lamp, looks can be deceiving. My 1997 Honda Accord has 234,000 miles.I have 2 problems with it. First: None of the gauges work, the power windows don t work and the transmission will not unlock from park and shift when I start it. The transmission will shift if the engine is turned off and I put the key on the console key hole and push down on it with the car key and I hold it down, then I can shift the transmission to neutral and the start the car and it will run o.K. Second:The engine will act as if it is running out of gas every now and then. It will idle fine, but sometimes it will do this. If I press on the gas pedal the engine will slow down more. If I pump the pedal it will eventually run smooth again. It doesn t do this all the time, just every now and then. Can you tell me what is causing this problems. The gauges not functioning should be due to a blown fuse. The trans interlock system is not functioning locking the gearshift in park. Check if the brake lights are working. If not, check the brake fuse and brake switch on top of brake pedal. The bogging down could be due to a faulty O2 senaor. It might not show up on the CHECK engine light but a diagnostic data reading would show. I Own A 2000 Honda Accord V-6 4 Door Sedan, About 47,000 Miles And The Srs Light On The Panel Stays On. It Will Not Go Out. Honda Accord 1982, 200,000 Mi. I Am Replacing My Speedo Cable But I Am Having Trouble Removing The Gauge Cluster. How Do You Remove It?